Des Moines, IA - The Marine Corps says it has begun investigating whether it mistakenly identified one of the men shown raising the U.S. flag at Iwo Jima in one of the iconic images of World War II after two amateur history buffs began raising questions about the picture. The Marines announced its inquiry more than a year after Eric Krelle, of Omaha, Nebraska, and Stephen Foley, of Wexford, Ireland, began raising doubts about the identity of one man. In November 2014, the Omaha World-Herald published an extensive story about their claims and Saturday was the first to report the Marines were looking into the matter. On Monday, the Marines issued a statement saying, “The Marine Corps is examining information provided by a private organization related (to) Joe Rosenthal’s Associated Press photograph of the second flag raising on Iwo Jima. Iwo Jima, a tiny island 660 miles south of Tokyo, was the site of an intense 36-day battle that began Feb. 19, 1945, between about 70,000 Marines and 18,000 Japanese soldiers. Capturing Iwo Jima was deemed essential to the U.S. war effort because Japanese fighter planes were taking off from the island and intercepting American bomber planes. Hal Buell, a retired AP executive news photo editor, had long discussions with Rosenthal about the flag-raising picture and in 2006 wrote a book about the famous image. It’s hard to understand the photo’s power in 1945 to Americans, who were weary of the war and horrified by the incredible number of deaths by servicemen, especially in locations of Asia most had never heard of, Buell said. 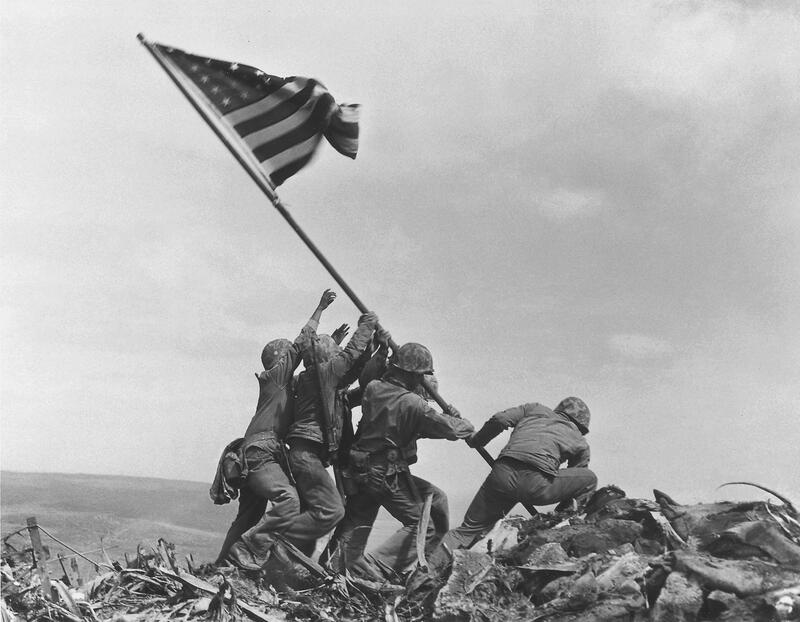 Buell said after Rosenthal shot the photo, the flag-raisers quickly moved onto other tasks, and it was impossible for him to get their names. That task was left to the Marines after the picture prompted an overwhelming response and the government decided to use the image in an upcoming sale of war bonds to finance the continued fighting. The identification of the six servicemen has been accepted for decades, but the World-Herald reported that while recovering from an operation Foley had lots of time on his hands and began noticing possible discrepancies in the picture. He enlisted the help of Krelle, who maintains a website dedicated to the Marines’ 5th Division. After examining the famous photo along with other pictures taken that day of the men, they concluded that the man identified as Bradley was actually Harold Henry Schultz, a private first class from Detroit. Schultz died in 1995. Krelle declined to comment on the Marine’s investigation, telling the World-Herald he had signed a confidentiality agreement with a third party. A message left by the AP at a phone number listed to Krelle wasn’t immediately returned. — Bradley wore uncuffed pants in the famous photo but other pictures shot that day shows in him tightly cuffed pants. — The bill of a cap is visible beneath the helmet in the flag-raising picture but not in other images of Bradley made that day. — The man identified as Bradley is wearing a cartridge belt with ammunition pouches, and a pair of wire cutters hangs off the belt. But as a Navy corpsman, Bradley would typically be armed with a sidearm, not an M-1 rifle, and he’d have no need for wire cutters. Other photos that day show him wearing what appears to be a pistol belt with no ammo pouches. Bradley told the AP he was shocked to hear the Marines were investigating the identity of the men. “This is unbelievable,” said Bradley, who interviewed the surviving Marines and Rosenthal before writing his book. “I’m interested in facts and truths, so that’s fine, but I don’t know what’s happening,” he added. The Marines didn’t give a timeline for its investigation.